ST-168 is amultifunctionAutomaticEncrusting Machine. It can fill the stuffing automatically and shape them to be ball, rod and stick-like. It can highly make out 100 productions per minute, such as baking cakes, cookies, meat and fish paste, the daily food us familiar with. 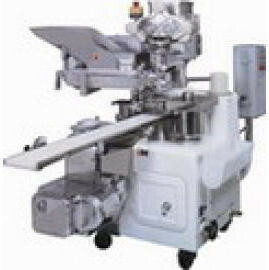 This machine can also add various of equipments according to your needs, such as Double –stuffing equipment, Dusting equipment, shape –making equipment(the product can fill in solid food such as tomato, chestnut, yolk, strawberry ) and all kinds of special rotating modeling(twist roll,), which make the form being diversified. In addition, our company can produce all kinds of cake moulds and equipments, and then rise up the additional-value of the machine. Sun pastry, Japanese cake, Milk crisp cake, Soft stuffing cake, Pie, Shortening cake, Mochi cake. ice cream Mochi, Rice dumplings, Meat pie, Meat ball, Grass pie, Sesame ball, Mochi. Hotpot condiments, Crystal steam stuffed bun, Fish ball,Pyramid steamed stuff bun, Roe pie, Fuzhou ball, Color fish ball, Pork ball, Pyramid dumplings .